How many times have you reorganized and cleaned out your closet to find tons of clothes that are still in great condition and perhaps still have price tags. Yup I'm totally guilty of this, and most likely I won't wear again. So what’s a girl to do, donate it all to a charity? Yes, that is an option, but what about selling it and getting some of your money back. A new trend has popped up within the last couple years, specialty sites made for you to sell your clothing and earn good money. With a bad economy the past few years, many people are turning to these sites to sell and/or trade their clothing, shoes and handbags. It’s easy, fun and anyone can do it. So if you haven’t yet cleaned out your closets, go get started and ready to make loads of cash! So where to start you ask, no worries I will guide you with a list of some of the web’s most popular sites. Poshmark – One of the web’s most popular sites to sell your clothes. Poshmark is app based so if you don’t have a smart phone, mainly an iPhone, iPad or iPod touch, then this may not work for you. Poshmark is community based which makes it popular. Once you sign up, create your cover shot for your closet and start adding items. They also have virtual Poshmark shopping parties to buy and sell with your friends online. Poshmark parties are quite popular with fashion bloggers. They will send you prepaid packaging once your item sells. Commission is higher than most at 20% of item price, but has a buyer guarantee. They will only release payment to seller until you the buyer receives item. No funny business going on here. Tradesy – Is another online site to sell your gently used items using the website or mobile app. You sign up creating an account with your email or with your Facebook account. Process seems simple and easy enough. You do the work, by taking pictures and adding the item info and description. Get paid via papal when your item sells, with a 9% commission on every sale. Tradesy will deduct commission from the sale, in addition to the PayPal commission. Tradesy will send you a pre-paid envelope with tracking once your items sells and you don’t have to worry about packaging, Which is a plus when selling online. Copious - Like the sites listed before Copious is an online market place with a mobile app. You can sell clothing, shoes, handbags and other items. Other sites only allow clothing and related items. Works similar to other sites, seller takes pictures and post items. Copious will take 3.5% commission and market place fee is 6%, which can be added to price of item if seller wishes. You the seller are responsible to package and send items with a set time frame. If you do not comply with shipping guidelines Copious cancels your sale. 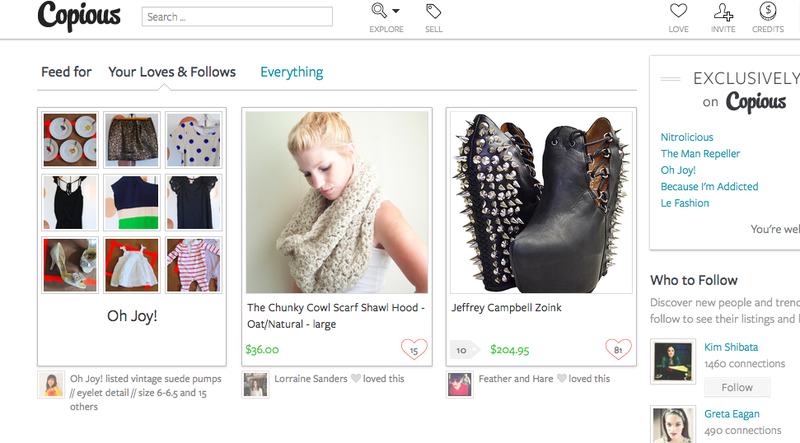 ThredUP –It’s like a consignment store, but on your mobile phone. You can sell not only your own clothes, shoes and accessories but your kids as well. Order a free “Clean Out” bag and fill it up with all your unwanted items and ship back to ThredUP. They will inspect and select the items and pay you up front for those accepted. You can also shop using their mobile app, which is free. Let them do the work of taking pictures and listing items, all you do is clean out your closet and ship it away. 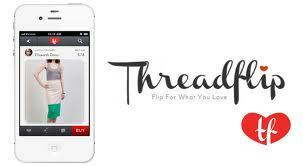 Threadflip – A social market place to sell unwanted fashion item, use website or mobile app. A large community gives your items lots of exposure and makes them more sell-able. Like the other sites Threadflip sends you the packaging materials and postage. Not need to worry about acquiring shipping materials. With a 15% commission fee, seems like an easy way to make a buck. If you just don’t have the time, patient or know-how, you can opt to use their “white glove” service. You send a box of your items, they select and professionally photograph the items to sell. Once your items sell they send you a check at end of month. So there you have it, no more excuses and reasons not to clean out your closets. Now is the time to get rid of what you don’t want and make some cash. After all you’re going to need cash fill up your empty closet. Happy Selling! Have you used any of these sites to sell or buy items? Please share in the comments. I really want to hear about your experience. Great! Do you have any experience or links to get a better feel of the community as a buyer and seller? I've also used FB Groups to sell/trade/barter many of my items. It takes a little longer as we can't "bump" it up to the page again until 7 days have passed, and the group consists of 5,000 members so your items may be lost from all the uploads that take place. I also use Ebay, but items usually sell at much lower prices unless it's a high priced/quality item that I have found works great for. Thank you SO much for posting. I've been trying to sell a few higher end items and they haven't been getting bites. Will try these. Thanks. What a fabulous post! Are you on Poshmark? I'd love to follow your closet! yes i like these ways of selling.